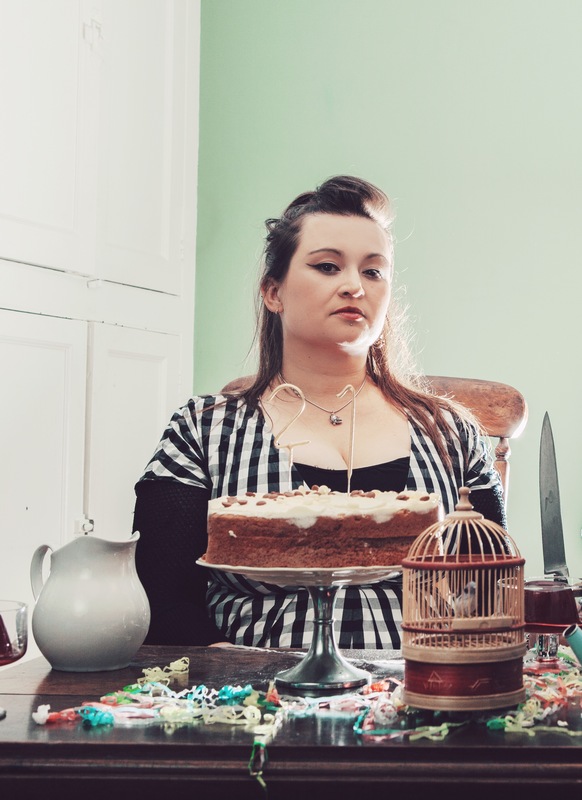 Eliza Carthy‘s history is like a colourful mural, painted with a wealth of experience over twenty-one years of touring and detailed with an impressive discography. I attended a gig recently at the MAC in Birmingham [UK] starring this favourite daughter of English folk-dom and her current collaborators Jim Moray and the Wayward Band, and had a chance to catch up with her in person. I found her down-to-earth, real, quite the English northerner, with an ability to interpret folk music using an alternative, out-of-the box approach. That’s her… and suddenly the title of her biography and compilation album makes so much sense. We talked about her music-steeped history, the state of English folk music, and how she balances her busy life as a mother and musician. Your parents were musical pioneers here in the UK during the 1960’s folk revival. Do you have any favourite memories from your early years in connection with the musical environment you were brought up in? Well, yes I do. Aside from being brought up on the UK festival and folk music scene, falling asleep under folk club tables and things like that, I’m very emotionally connected to the Sidmouth and Whitby folk festivals… I have lots and lots of good memories. I remember Jody Stecher coming to stay at our house as a child, when he was touring the UK with Krishna Bhatt, and with his wife as well, and I’ve spent many happy hours at their house in California. Once we had a lovely Cajun family come to stay with us, and they cooked jambalaya in the back garden; it was absolutely amazing! I have some very good memories of the American folk scene. I grew up going around with my parents [Martin Carthy and Norma Waterson] when I was a teenager and that included (when I got a bit older) doing their American tours as well, playing the Iron Horse, and the Ashokan folk camp, Davis and Elkins College in West Virginia, places like that. On the English folk scene, growing up in a musical family, I knew a lot of traditional singers; not just performers, but people who had learned music from their families, like the Copper Family, Walter Pardon, people like that, so… I feel I’ve had a very rich musical life. Was there ever a period where you thought “This is what I’m going to do”, or did it just happen? I did think that I probably would end up doing this. I think it was a bit more “Barbie pop star” in my head, but [laughs]… I pretty much saw myself doing this kind of thing. Bob Dylan was a big hero of mine when I was a kid, troubadour songwriters, you know; I saw myself there with my baby on my back… that sort of thing. A nice thought, but not very practical! Where did the title of Wayward Daughter come from? It came from the biography that was written last year, so I guess it was Sophie Parkes’ idea. Originally, the album was supposed to be released in conjunction with the biography but we had some delays so it came out about six months later. Do you ever feel that people are trying to stereotype you as a particular type of artist? Not that people are trying to, but… I think that people encounter you at one or another stage in your life or in their lives, and you will always be that thing to them. So in some ways I was at my most successful when I first started because my second album [Red Rice] got the Mercury prize and it sold close to 70,000 copies, so… a lot of people see me as a tinkerer, as somebody who likes to try folk music with beat. It’s part of what I do but I’m also a songwriter, and there are lots of strings to my bow these days. I do perform in these big “bells and whistles” bands, but I also perform solo, and with my father, and still with my family regularly as well. Your roots are steeped in English folk heritage and I really admire the way you’ve started with these traditional English songs and just taken them somewhere else, often incorporating other cultures (like with Imagined Village) and other collaborations you’ve been part of. Do you feel like you’re on a mission to keep these old songs alive or do you just sing them because you enjoy them, or is it a mix of the two? I think it’s a bit of a mix of the two, really. I can relax a little bit now, but certainly when I started [aged 16] English folk music was a lot less well known than it is now. We have this incredibly rich scene of young performers now playing English folk music in various different kinds of ways. We have bands that get into the charts, and we have festivals full of people playing English folk music. In 1995 it was not like that at all, so I did feel the need to wave my own particular flag. Celtic music was very popular in the 90’s and I felt like it was swamping any interest in our own music. I knew so many people who played Celtic music and didn’t know that English folk music existed. There was a huge Cajun scene here as well in the 90s and they were playing the blues, and they were playing old-timey music, and nobody was playing English folk music. I really felt that English musicians needed to pay attention to their own culture before they started having a go on other people’s! Definitely. I know when I first moved over here, I thought traditional English music was “Riverdance”! I’ve learned a lot since then. Yeah, well, and you know, whilst I adore The Lord of the Rings –I do adore The Lord of the Rings— Tolkien wrote The Lord of the Rings as an English saga; he didn’t write it to be full of Irish pipes or indeed Finnish music, this sort of wifty wafty Celtic music everywhere. These were things that were written specifically for the English, you know, and it does grate. I want people to know that there are historically accurate and also exciting versions of our own stuff that’s out there. Filmmakers need to make exciting and “out there” choices, you know; there’s only so many times you can hear the modern Irish pipes in a medieval Scottish movie! Are there any out-of-character cover versions that you’d like to do, that you haven’t done yet? Out-of-character cover versions would have to be something like “She Moves Through the Fair” for me –something I would never do!– or “Loch Lomond” or “Danny Boy”; I don’t know! They’re good songs in their own way, but…! Me and the girls –the fiddle band I play with [Carthy, Hardy, Farrell, & Young]– we’ve been thinking about doing an album of Julie Andrews covers. I have two children now, two little girls, so I watch Mary Poppins a lot! You seem to have an ability to tie together the past and the future, creating this music that has the potential to be appreciated for many years to come. How do you feel about the expectations on you? Do you think people have expectations about you being “the future of folk music”? No, not anymore. I’ve been around too long now. People think I’m part of the woodwork; I’m at that stage now! Have you thought about touring further afield? I have. We’re touring the States at the Easter break next year: myself and Saul Rose and our regular guitarist Dave Delarre. We’ll be promoting Wayward Daughter. Oh, and then I’m going to New Zealand with my dad [Martin Carthy] in October. I’m all about Europe at the moment. I’m trying to get into Europe because there’s this huge folk music scene there and they have no idea that English music exists. That’s my little bugbear at the moment, trying to let the Europeans know that we’re here. I get the impression that you’re involved in a lot more than touring and recording. What are you doing closer to home? Well, I have my two little girls now, so I’m doing that; but the next big thing, aside from recording and touring, is that I’ve taken the position of associate artist at the Sage Gateshead for the next two years. I’ll be curating different shows, putting stuff on, interesting collaborations, also working with the Sunderland jazz degree course, and the Newcastle traditional music degree course as well. I’ve got some ideas for projects involving traditional English percussion and dance, so I’m going to be busy. It’s going to be good fun! How do you find a balance with all your busy-ness? I just treat it day-to-day, to be honest. I try to give my children as much time as I can. Since their father and I broke up, they tend to go with him now when I work. And it’s hard, because I miss them, but no other mother of toddlers gets the kind of sleep that I get sometimes and I feel very grateful! It was harder last year when we were breaking up and everything was up in the air, but I think we’ve found a nice balance now; things are really settling for them and they both seem really happy. My eldest is starting school in September, and she’s really excited about that. I’m so proud of her. Last question… Are you one of those strictly-strong-tea-swilling Northerners or do you sneak in the occasional cup of coffee while deep in late-night writing sessions? No… I only have a cup of tea with my breakfast! I don’t drink tea all day. I have coffee in the afternoons and then usually, gin in the evenings. Or wine, or rum. I’m quite fond of rum. Great Q & A! Enjoyed reading this.